My website features the best Brantford real estate search for homes, condos, land and multi-residential properties available. It is the only site you will ever need! It is easy-to-use and updated by the official MLS database every 15 minutes. Brantford is located on the picturesque Grand River in Southern Ontario. Our community was situated at an important crossing point on the Grand River (Brant’s Ford) and served as a resting place for travelers. Brantford is centrally located to Hamilton, Toronto, Kitchener Waterloo and Buffalo and there are four international airports within a short two hours drive. Brantford is a great place to raise your family, or to invest in our vibrant real estate market. Brantford has a small town feel, but still provides all of the amenities of a larger center. 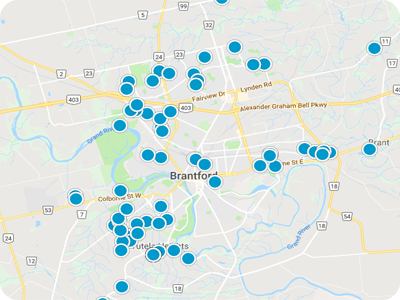 Whether you wish to live in a suburb close to schools and shopping, or in one of the more rural areas, Brantford and Brant County have something to offer everyone. Our City was touted as one of the most affordable places to live by Huffington Post and its' close proximity to highways allows commuters easy access to their places of employment. If you are seeking a place where the people are warm and welcoming, that offers great outdoor activities, cultural diversity, Laurier University, wonderful restaurants, kayaking, fishing, bike trails and affordable Real Estate, its' time to make Brantford your home.